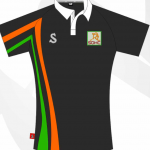 The Club uses SilverFx as its supplier of sports kit branded with the Club logo. Additionally, some items of kit can be personalised with a member’s initials. From Sep 2016, the Club will have new shirts sponsored by Dukes, Sidmouth. Shirts are provided for all teams with an option for all players to buy their own shirt at SilverFx. 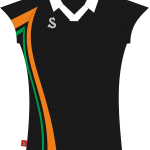 Regular Kit: We play in black Club shirts with orange and green detail, black shorts/skorts/skirt and plain black socks. From Sep 2016, the Club will adopt a continuous number sequence across its men’s and women’s teams rather than each team squad having squad shirts numbered 1-16. We have dedicated Club area at SilverFx for all our Club kit. Simply follow the instructions. For Playing shirts, after you have placed your order, the Club allocates a number to SilverFx. This avoids duplicate numbers being issued. There are two delivery options: home address (the member pays P&P) or via the Club. Order delivered to the Club are sent to the Club Kit manager – you don’t pay any P&P but, you will need to arrange to collect your order locally. If you have any questions, please contact George Powell, Club Kit Manager – 07944 620823. There is a degree of risk when playing any sport. We therefore strongly advise players to take all necessary steps to protect themselves against injury when playing hockey. For adults this is a personal decision but, in accordance with England Hockey’s best practice guidelines on safety, we strongly recommend that players use a gum shield and wear shin pads as a minimum. The use of gloves in general play and face masks for personal protection when defending at penalty corners are recommended but not mandated. The Club does not provide these items as the decision to use them is made by parents or adult members. Personal protection equipment can be obtained from all good hockey equipment retailers. Juniors. For Juniors we insist that parents/carers ensure that their child wears a gum shield and shin pads at all times when playing senior and/or junior hockey. Hand protection is also recommended. Parents may wish to provide a face mask for their child for added protection when defending short corners. This is a matter for individual parents. Goalkeepers. The Club can provide full protective equipment kits for Club goalkeepers – senior and junior. This equipment is loaned on a match by match basis. Specialist goalkeepers may wish to purchase their own kit. The Club recognises that goalkeeping equipment is a significant investment and, as a result, does not collect an annual membership subscription from keepers who own and use their own kit.